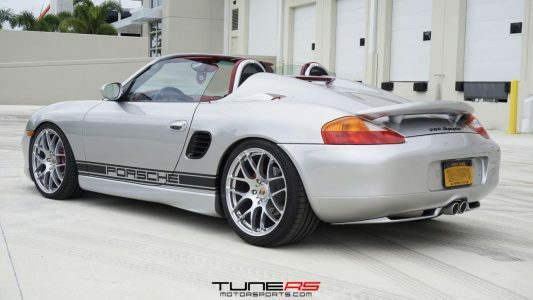 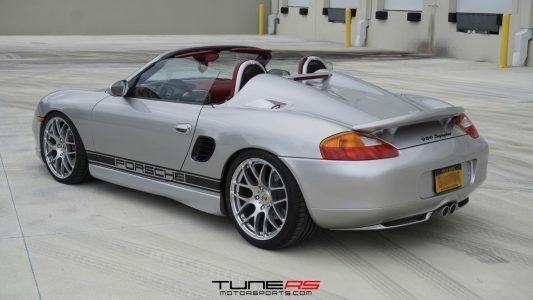 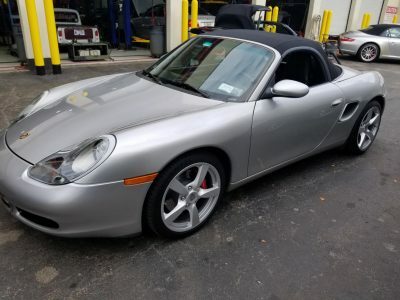 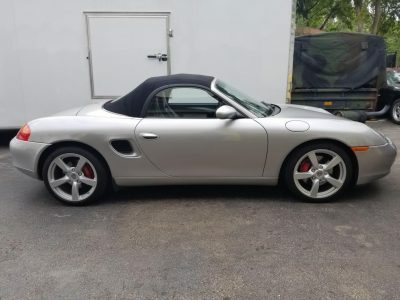 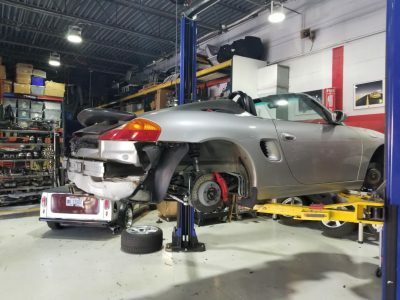 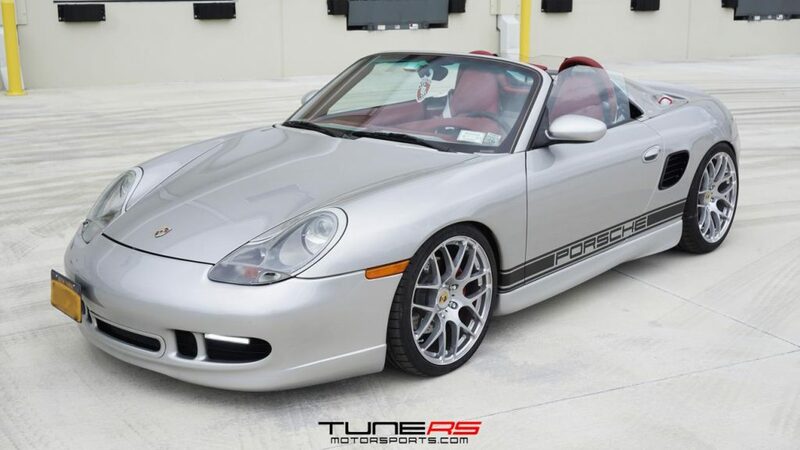 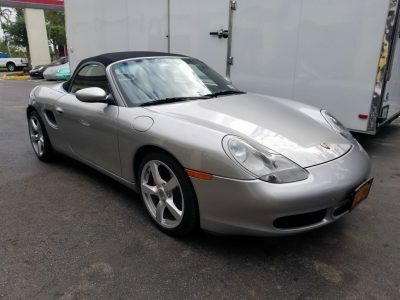 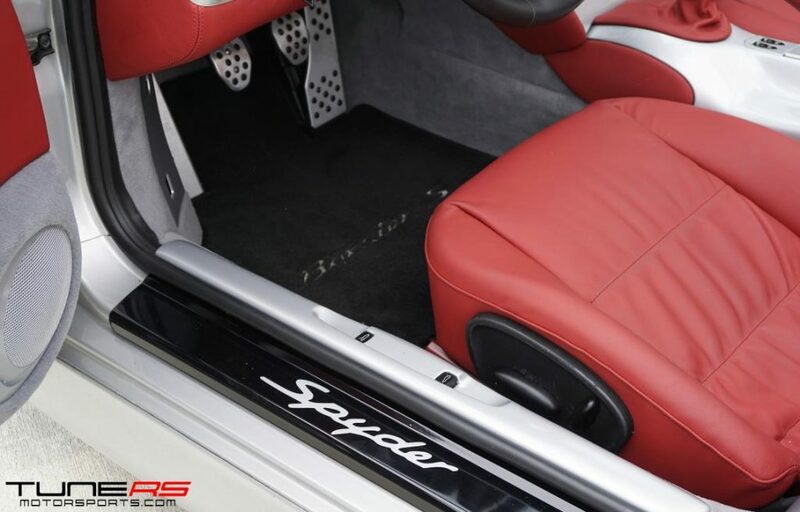 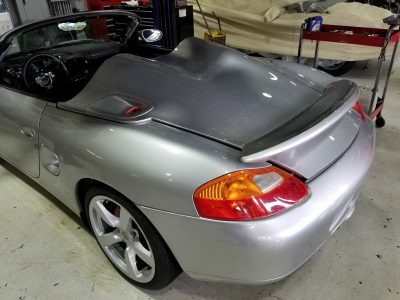 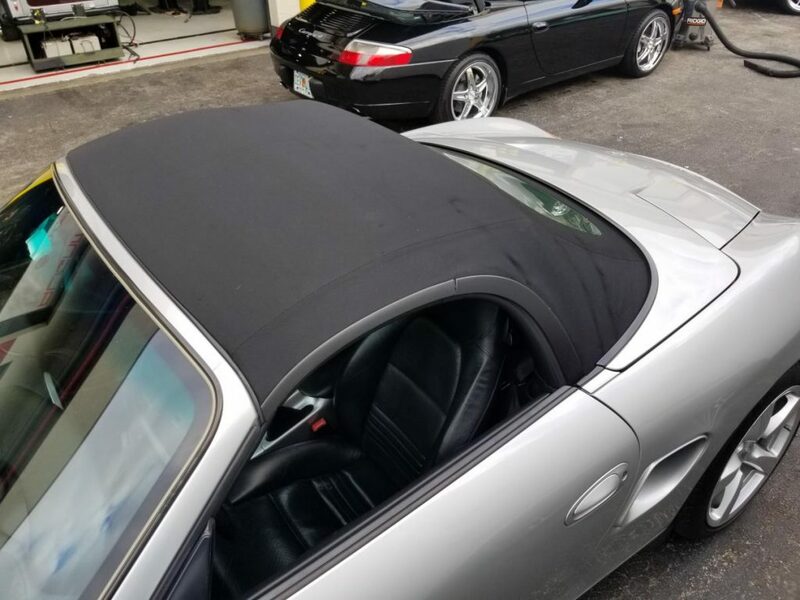 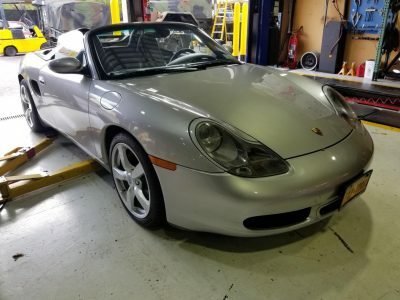 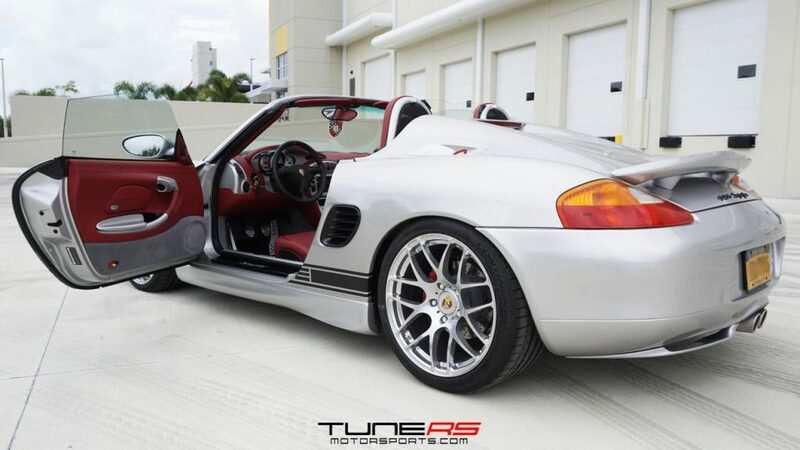 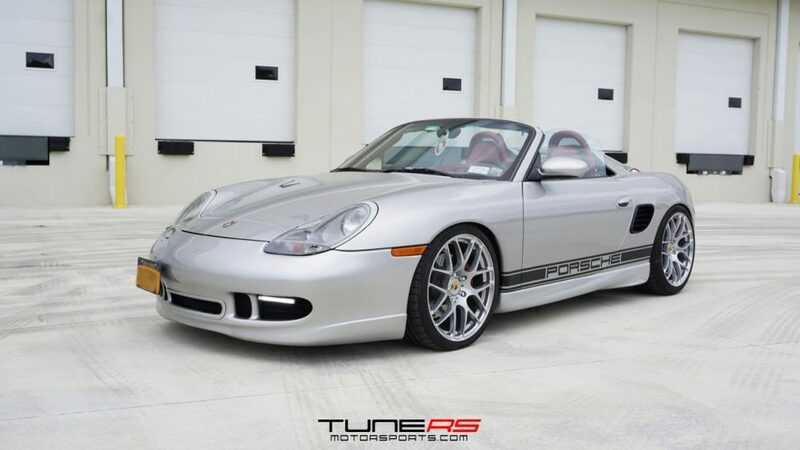 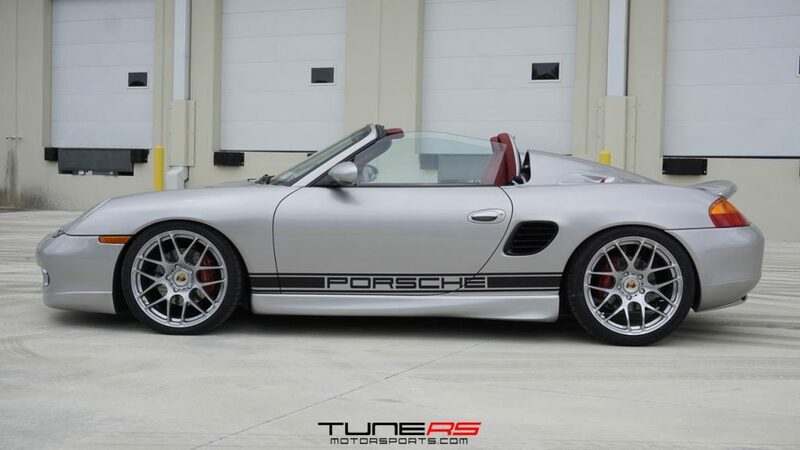 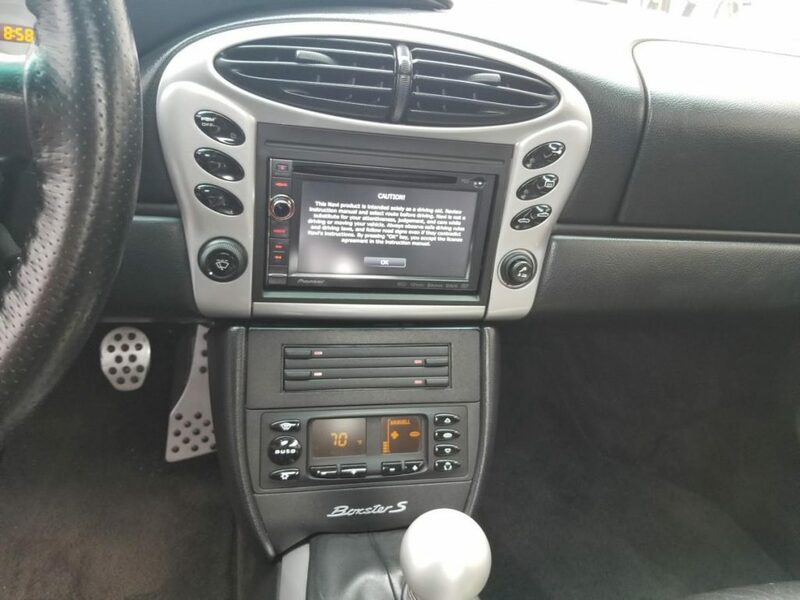 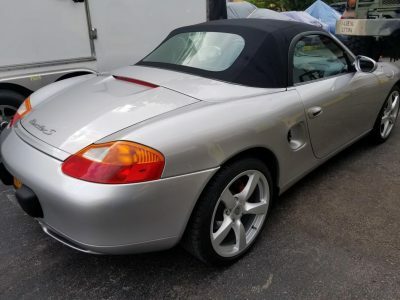 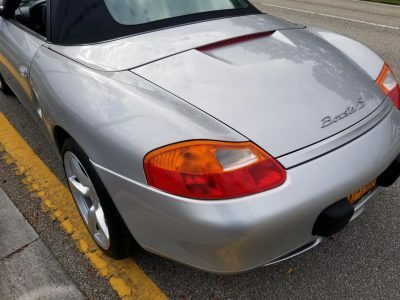 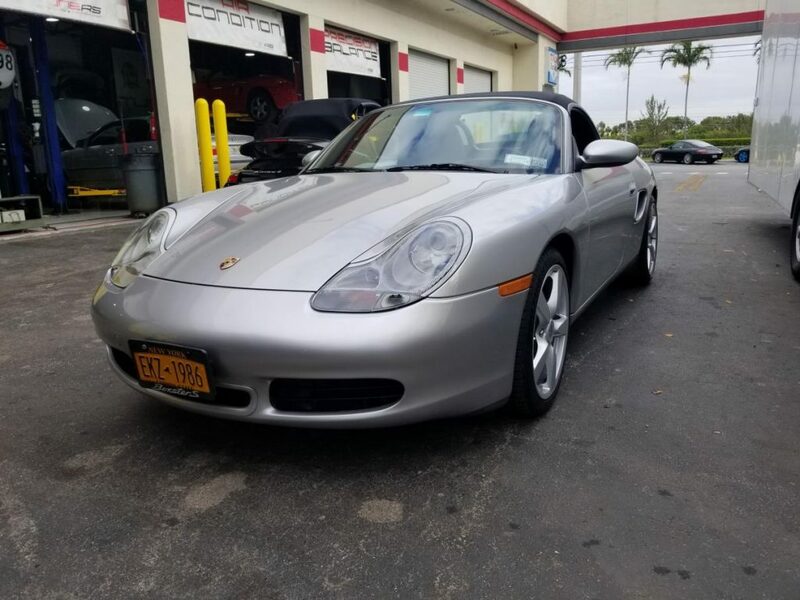 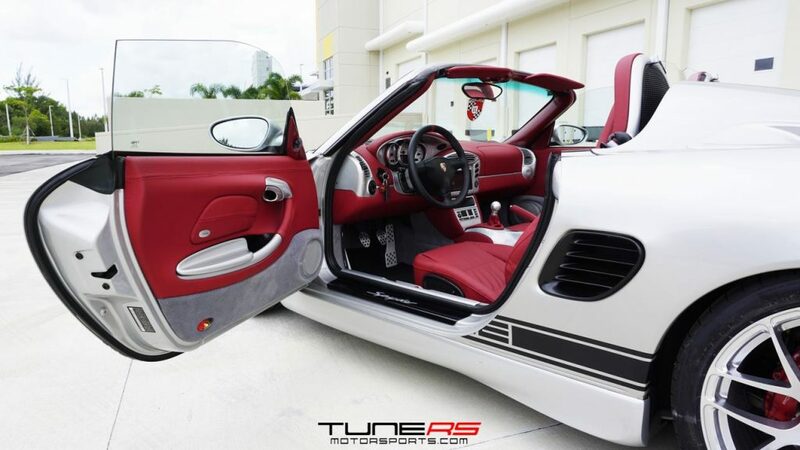 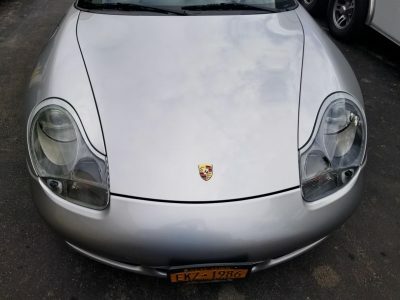 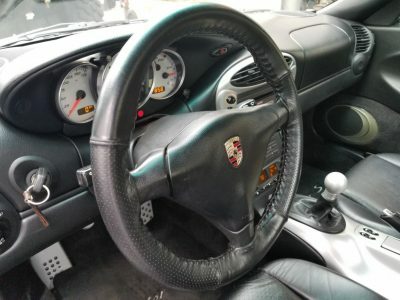 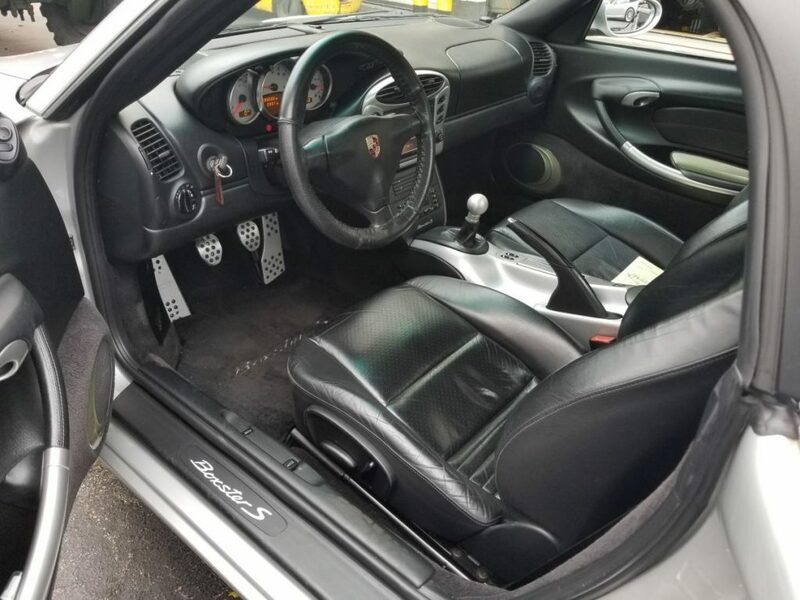 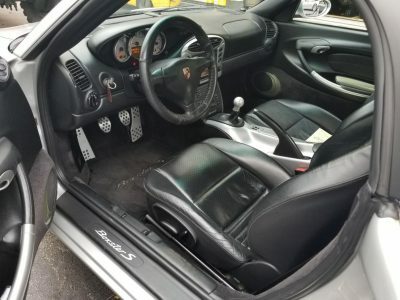 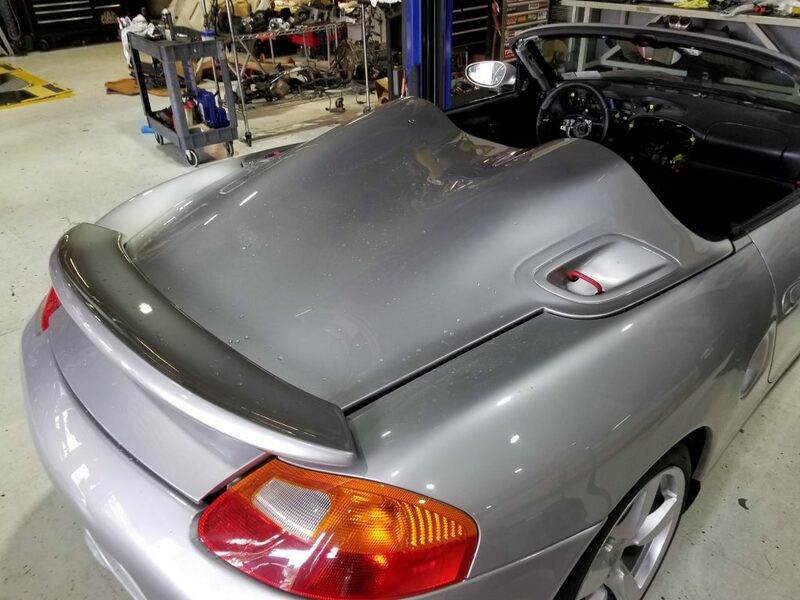 This 2001 Boxster S was sent to us from a New York client who commissioned us to transform his 01′ Boxster S into a 986 Spyder with a few personal touches. Below is the transformation process! 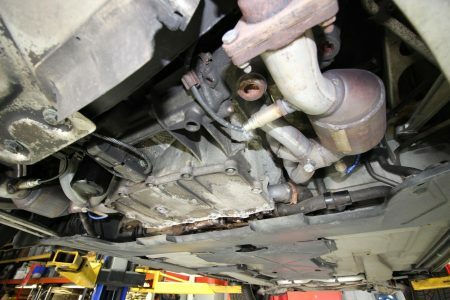 The undercarriage on this vehicle had seen some better days. 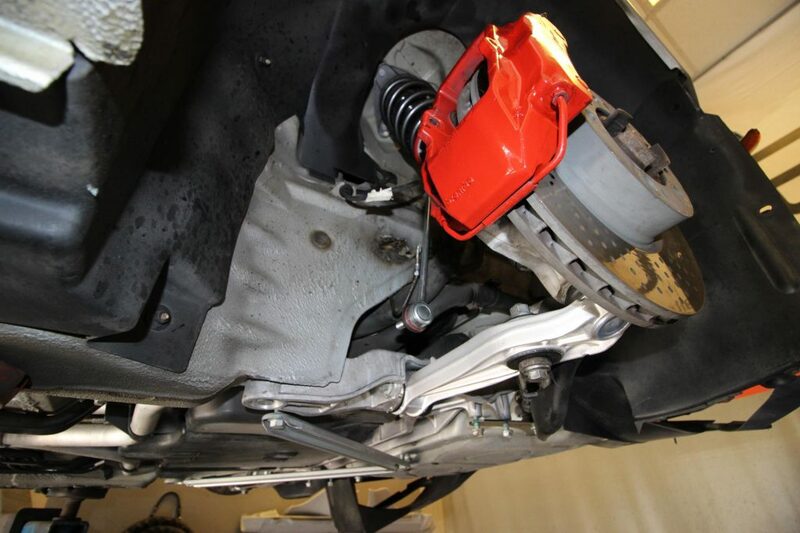 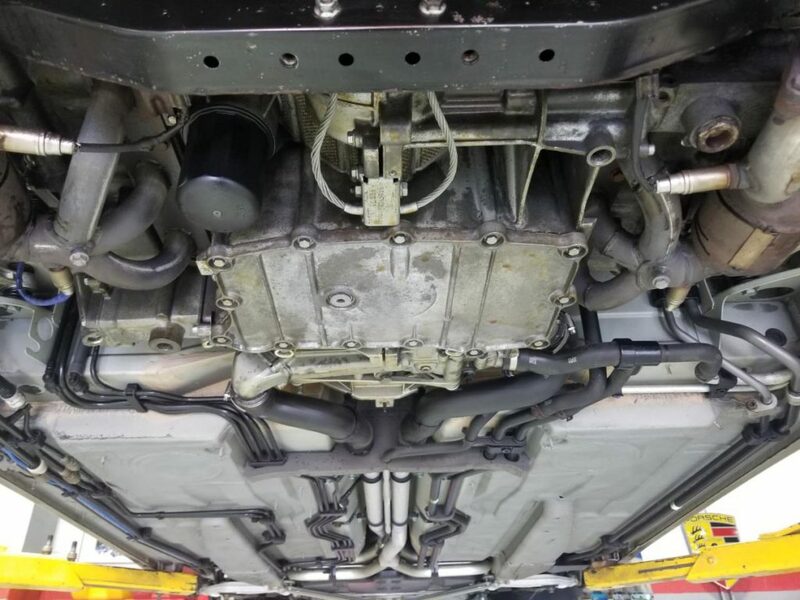 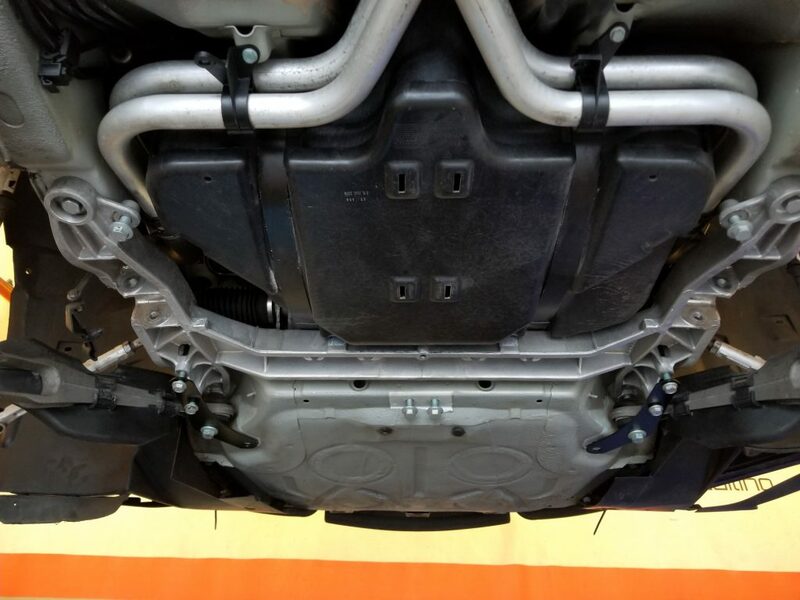 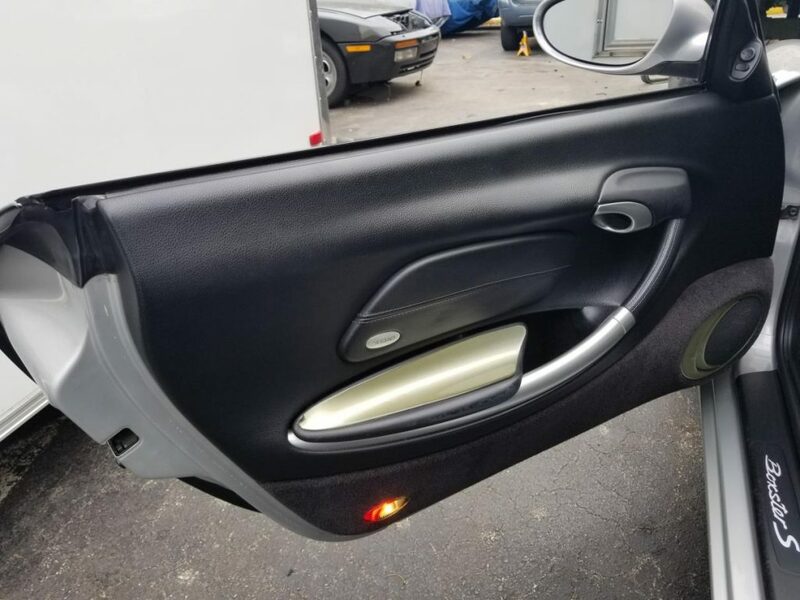 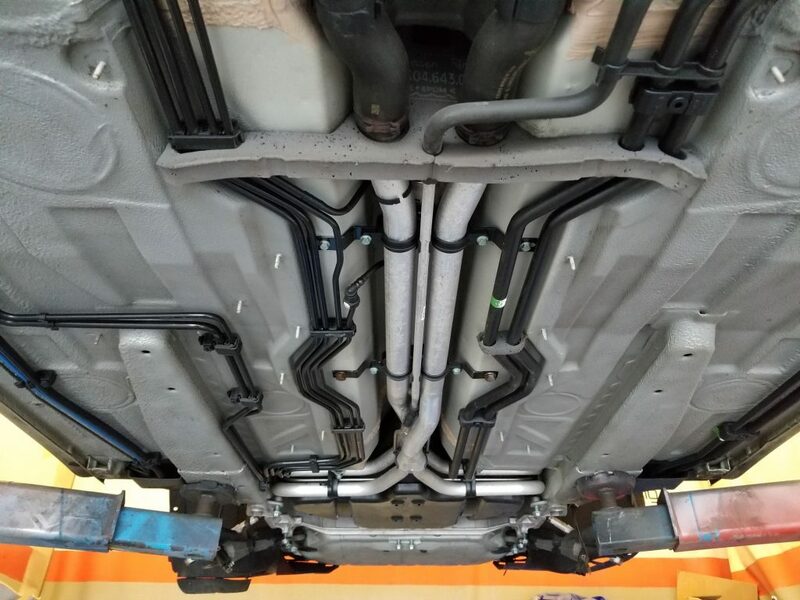 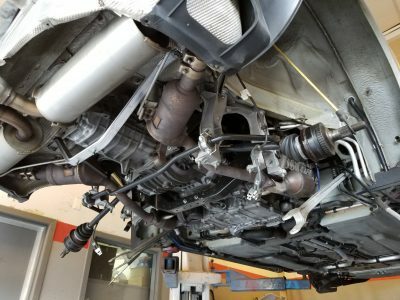 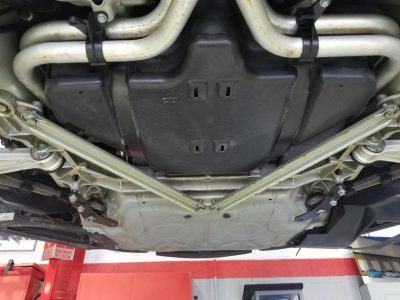 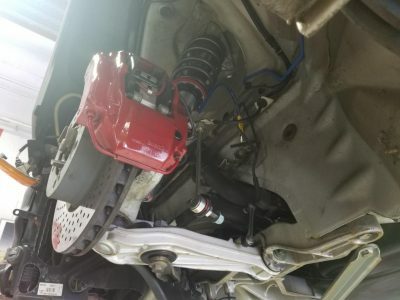 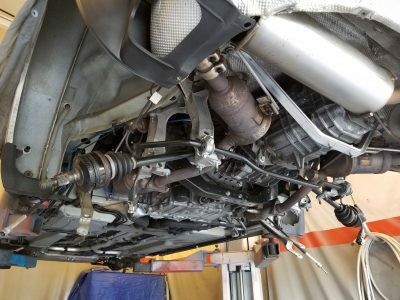 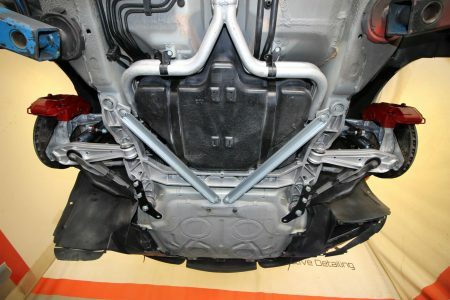 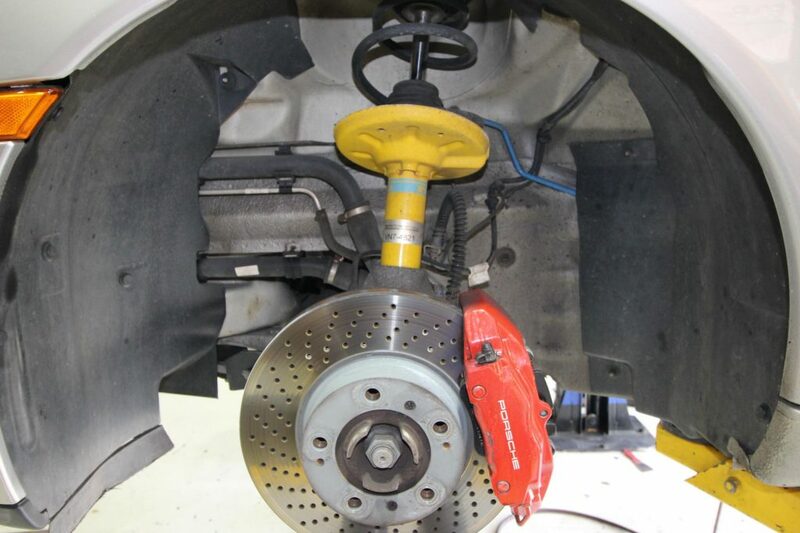 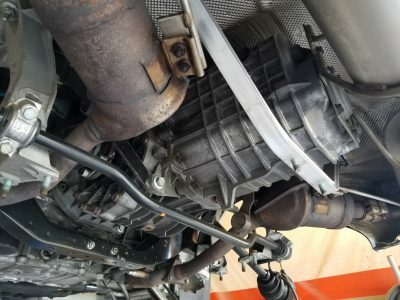 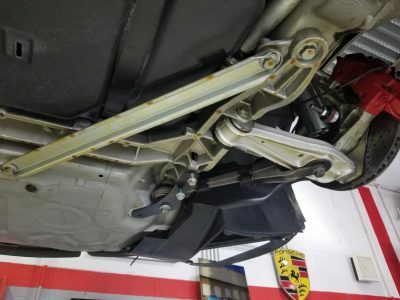 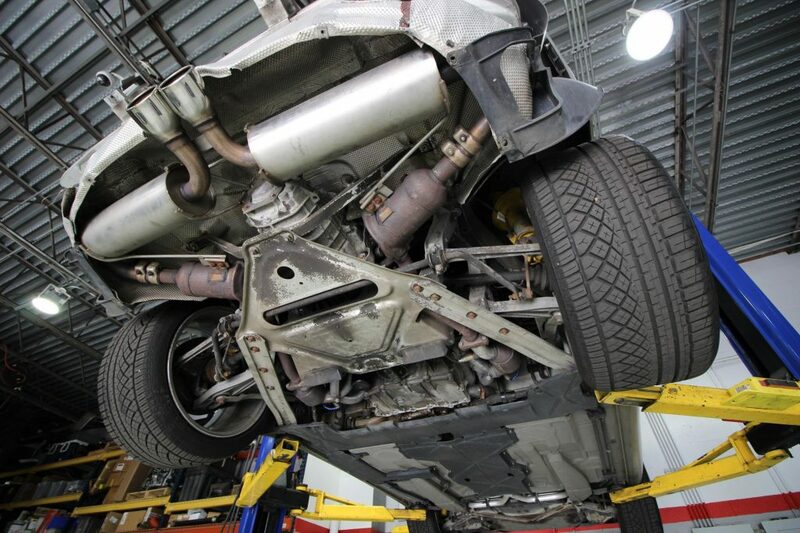 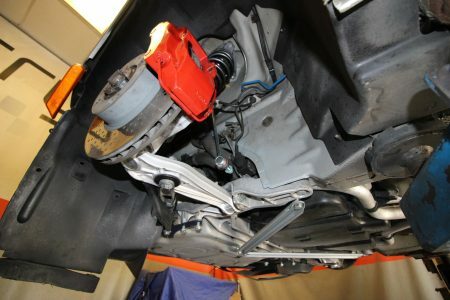 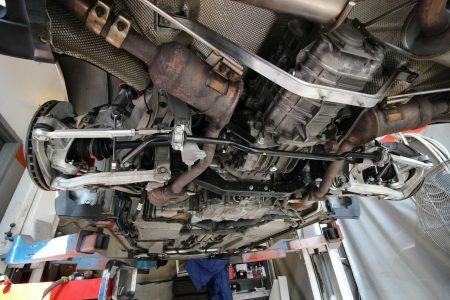 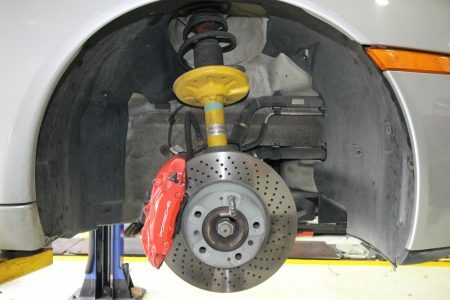 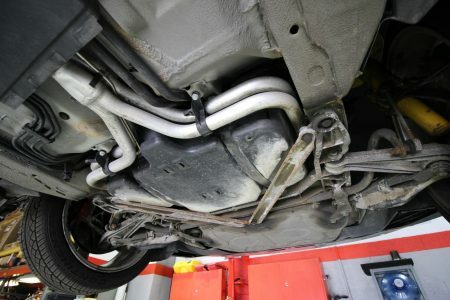 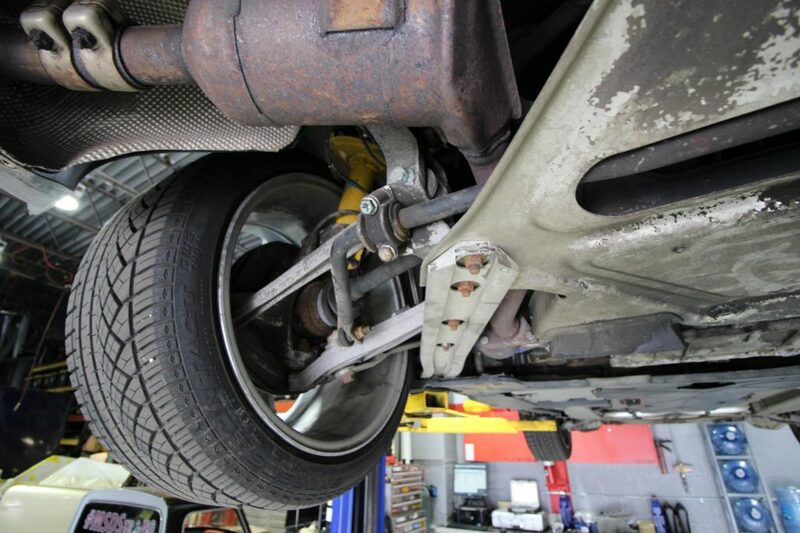 The first item performed was a complete CryoDetail(tm) to remove all of the contaminents, grime, dirt, debris, anything that had attached itself to the undercarriage over the years. 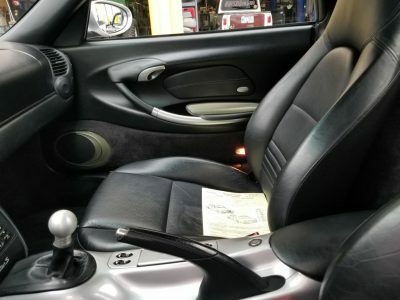 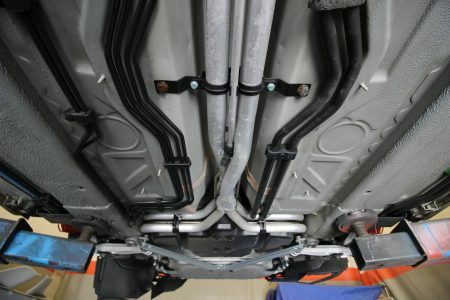 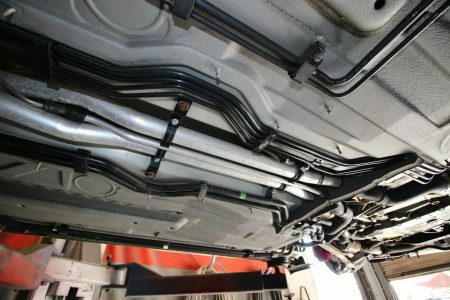 The vehicle overall was very clean and did not require many, if any, replacement components. 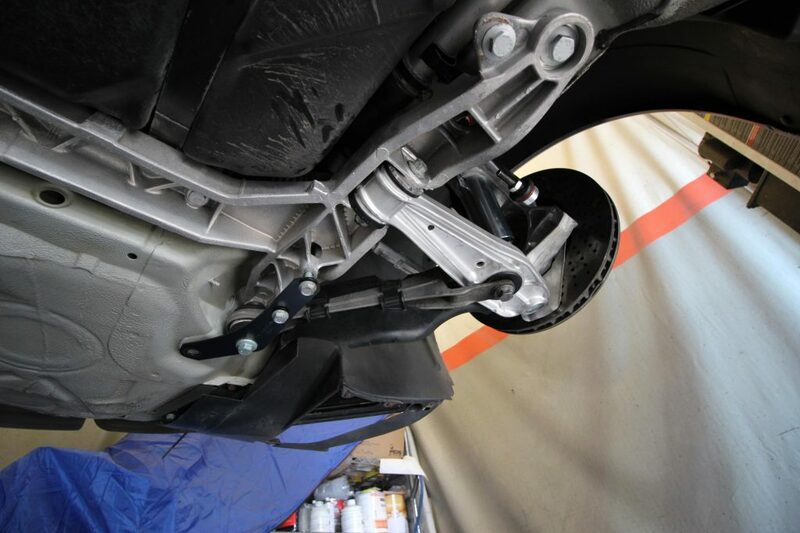 Once the CryoDetail was completed, we re-coated the entire undercarriage with factory amber color cosmoline to protect it from the elements in NY. 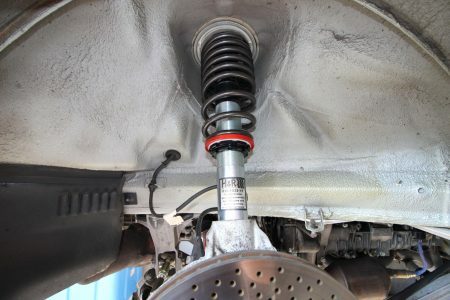 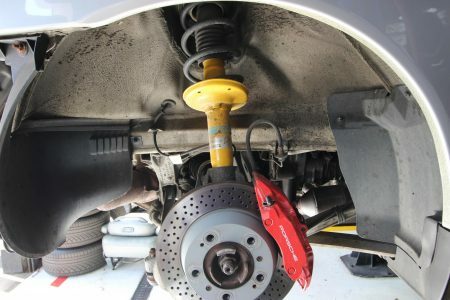 The suspension was all original, minus the Bilstein sport shocks that had been replaced at one point in the vehicles life. 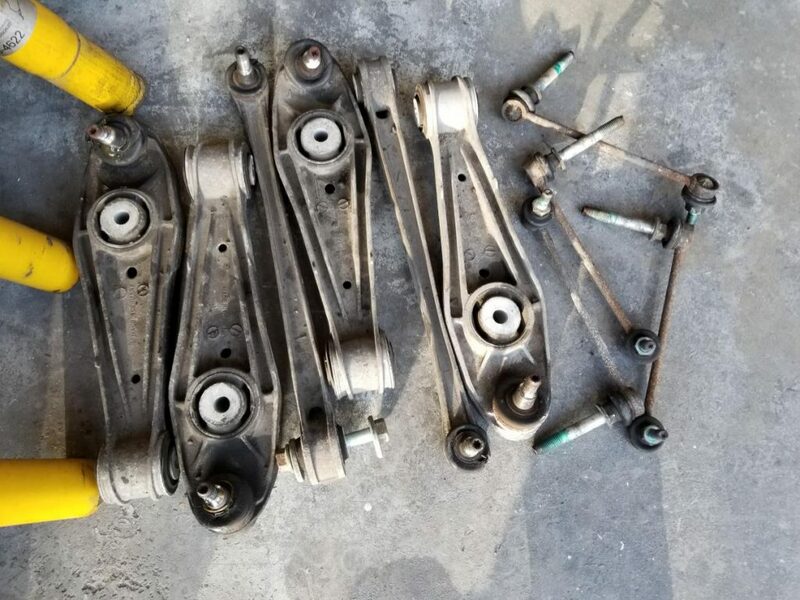 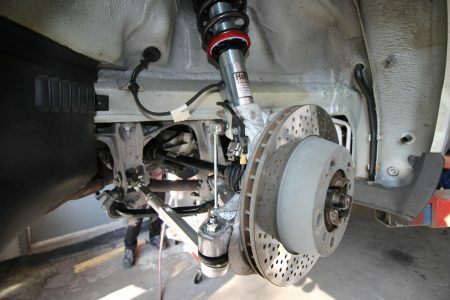 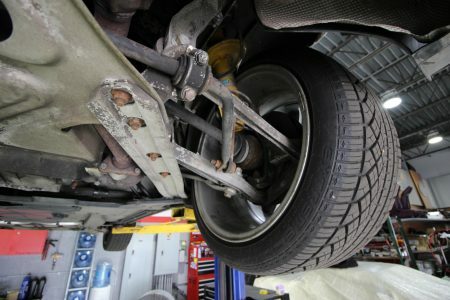 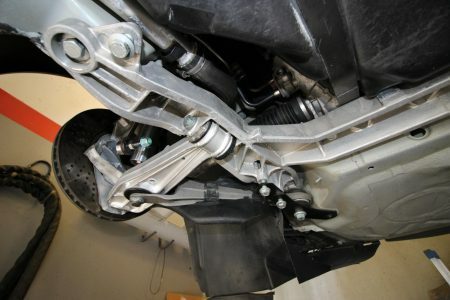 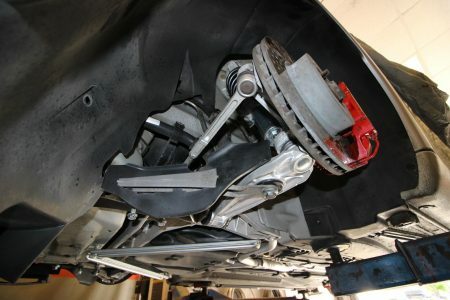 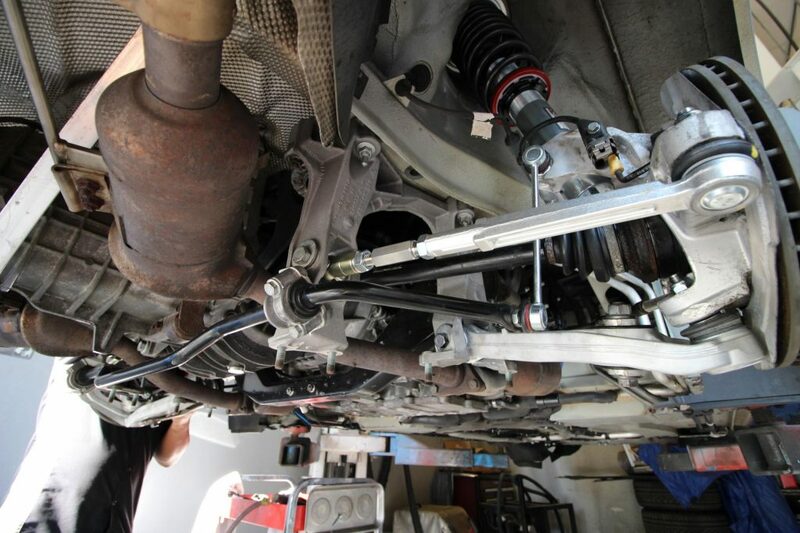 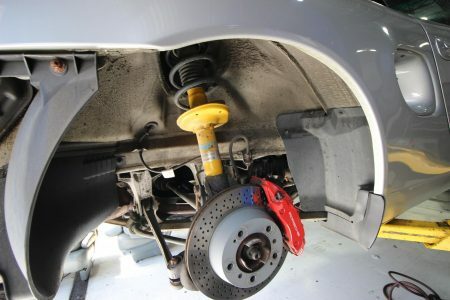 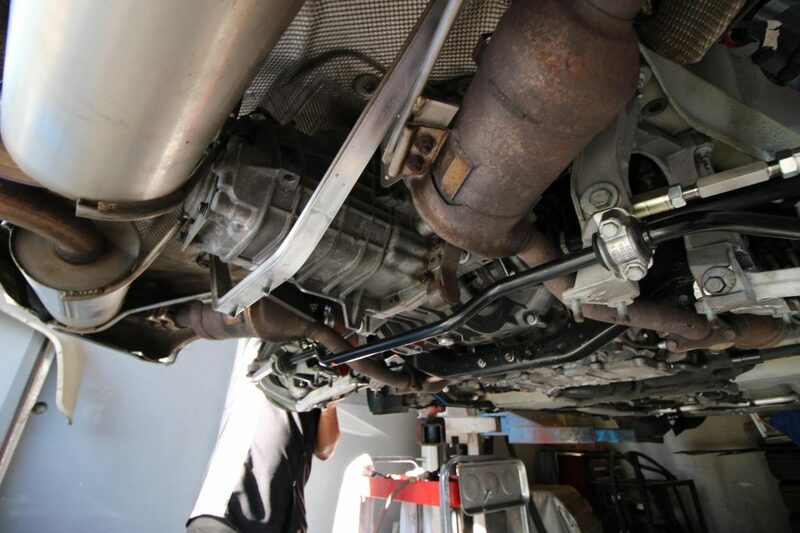 All of the sway bar links and lower control arms were completely shot and required replacement. 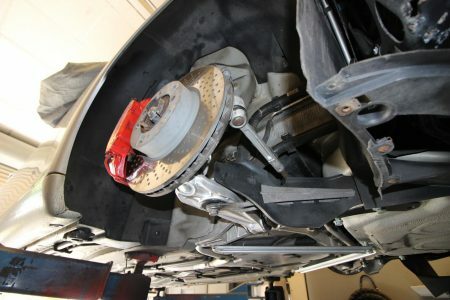 All new wheel bearings were also done to ensure everything was solid. 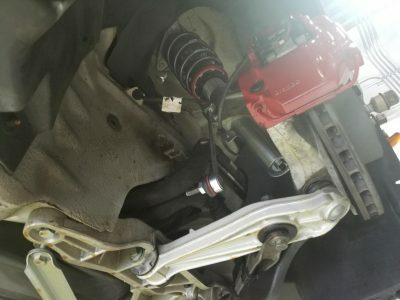 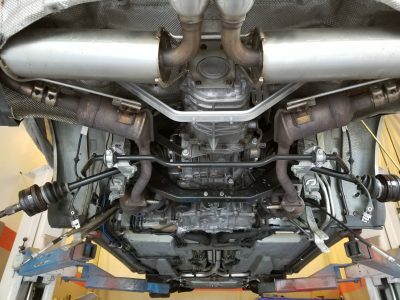 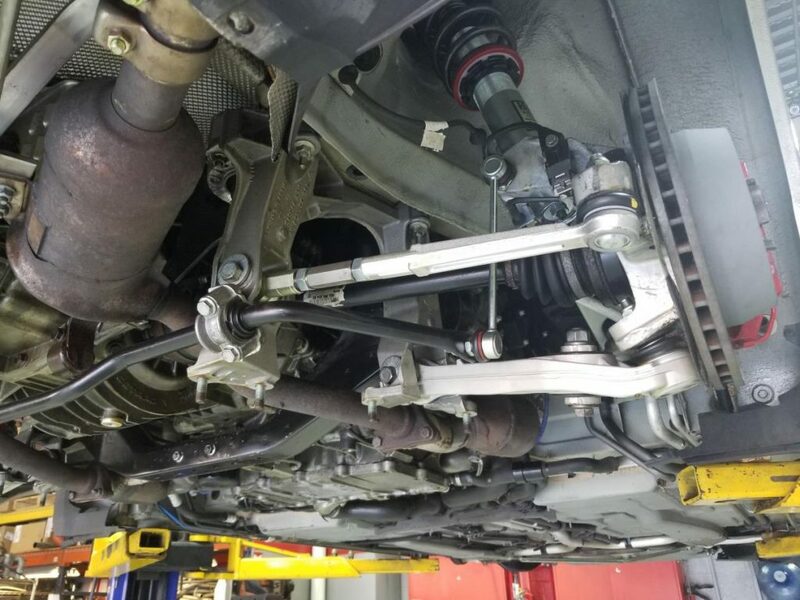 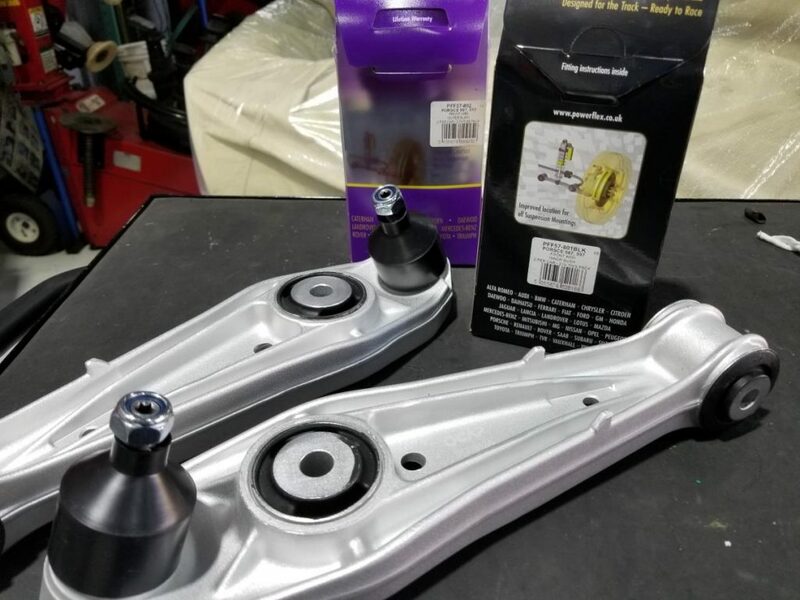 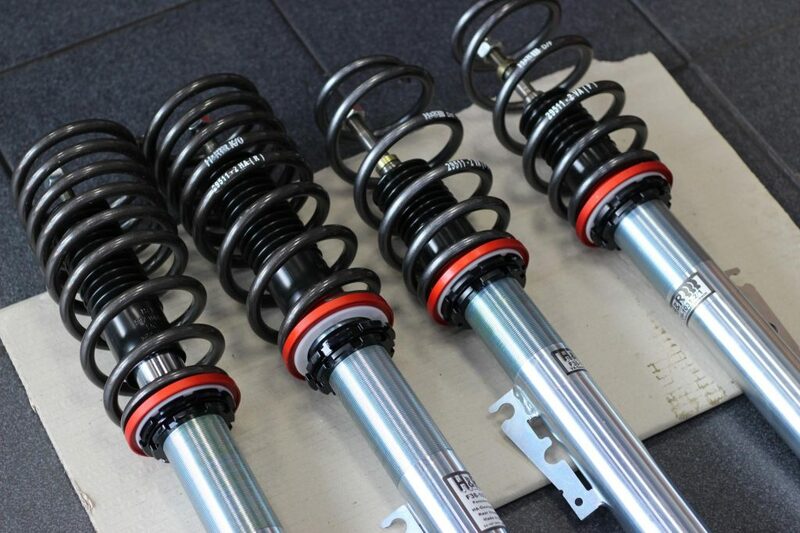 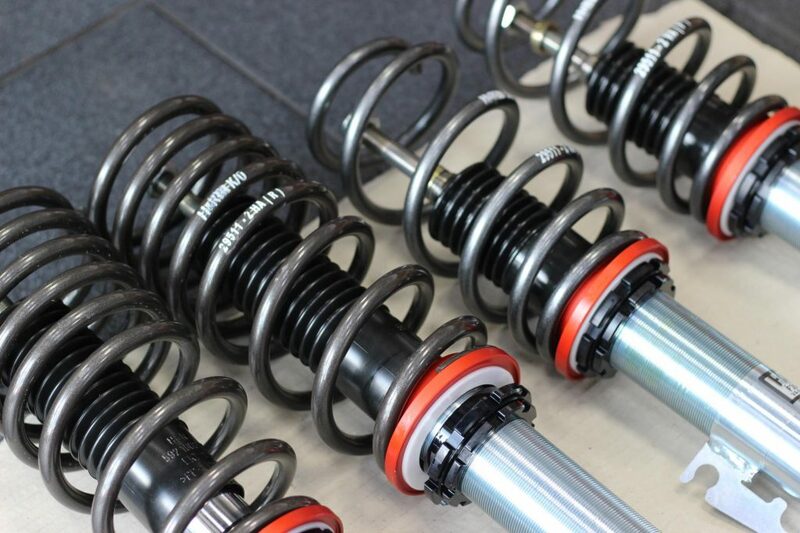 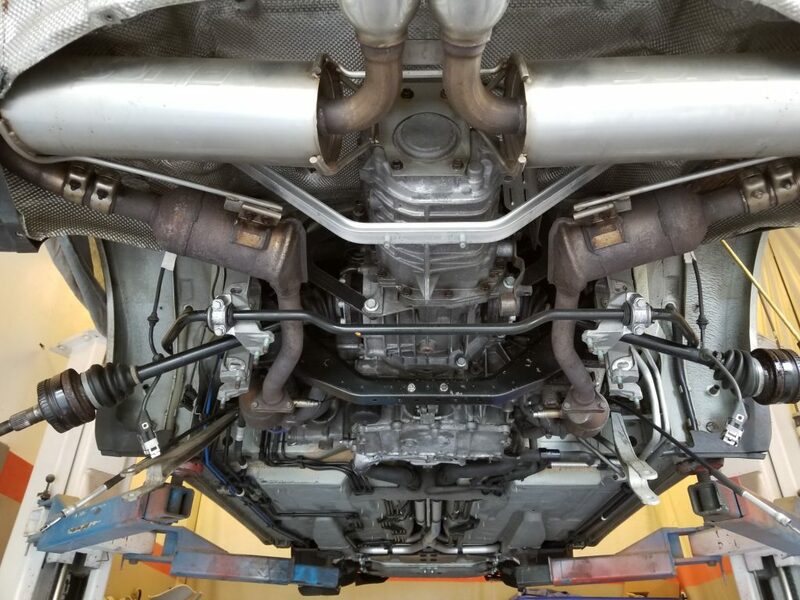 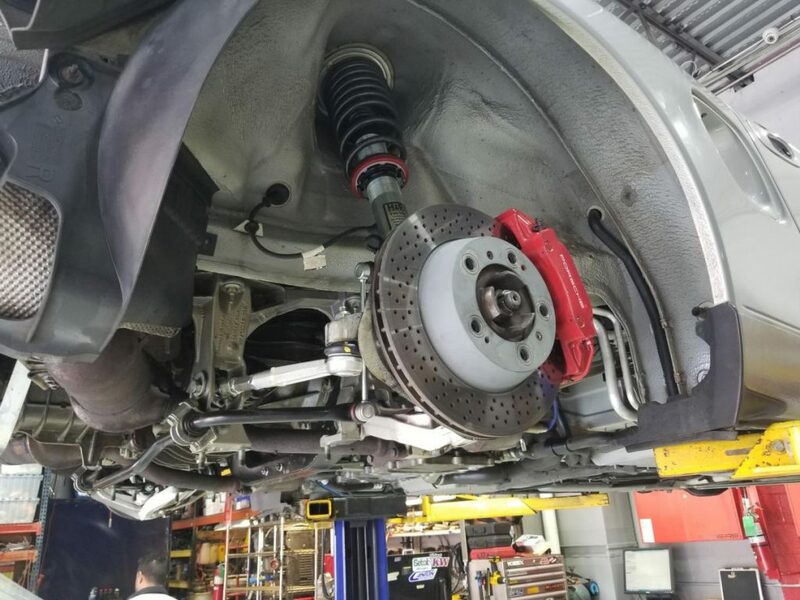 A set of new H&R sport coilovers were installed, our TRS rear toe control arms and all new lower control arms with Powerflex polyurethane bushings for a much improved handling vehicle. 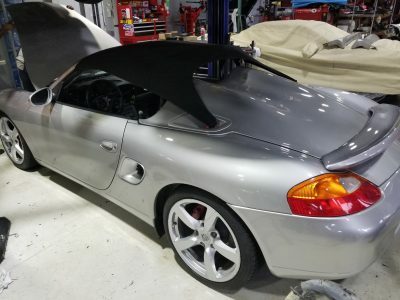 Now for the Spyder conversion. 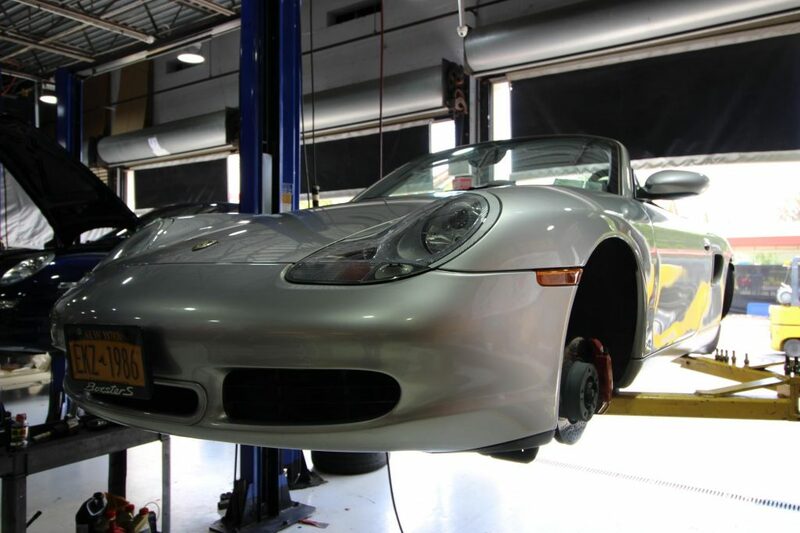 Our 986 Spyder gives the first generation Boxster a 987 Spyder look and is a direct bolt-in kit with very minor modifications needed. 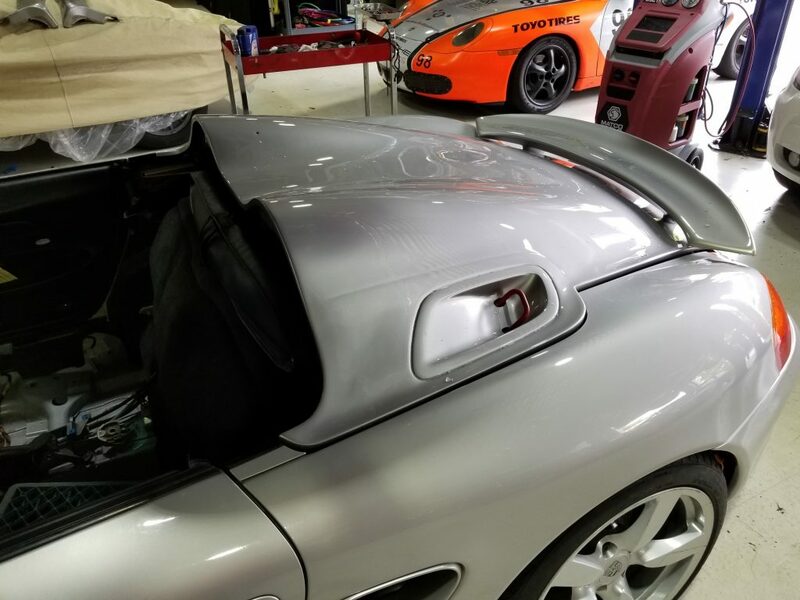 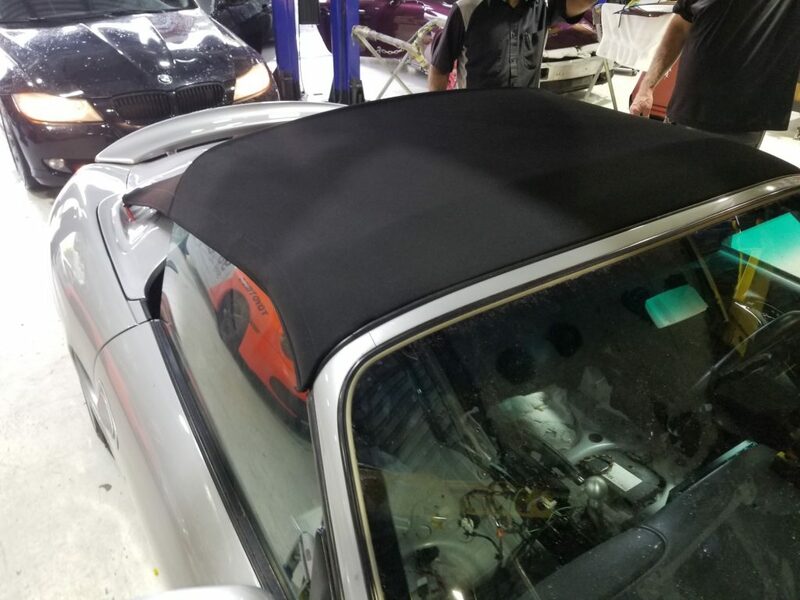 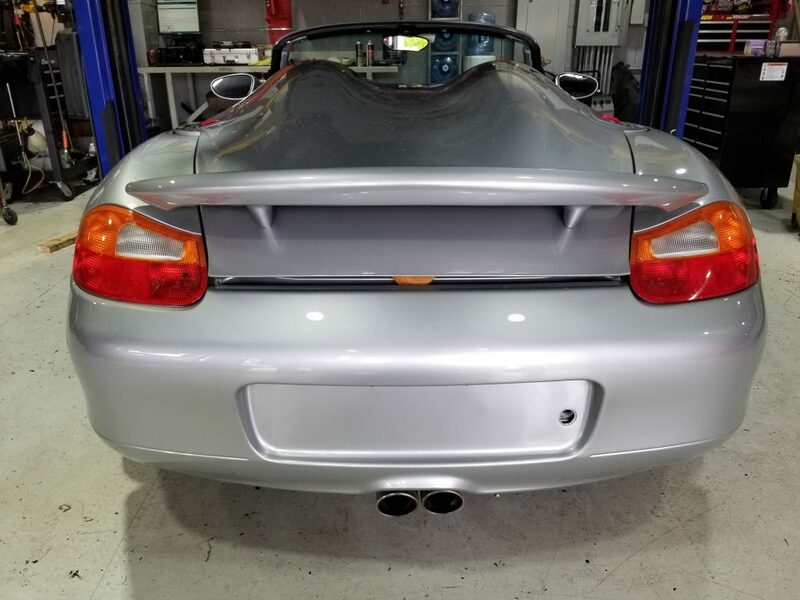 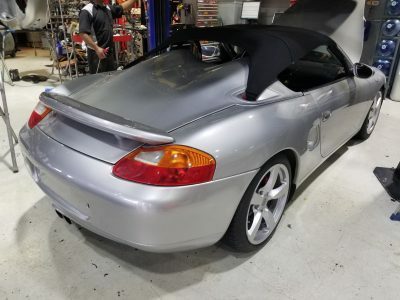 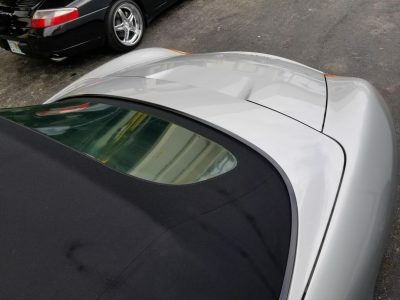 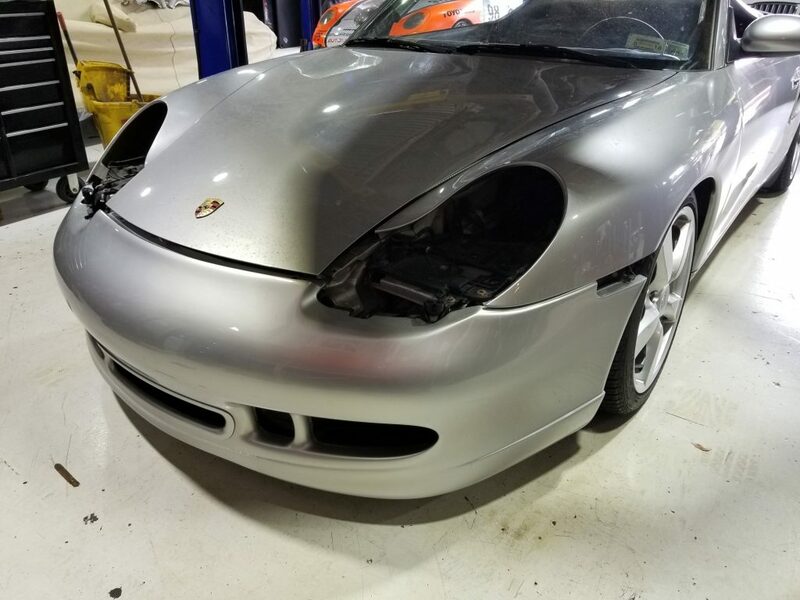 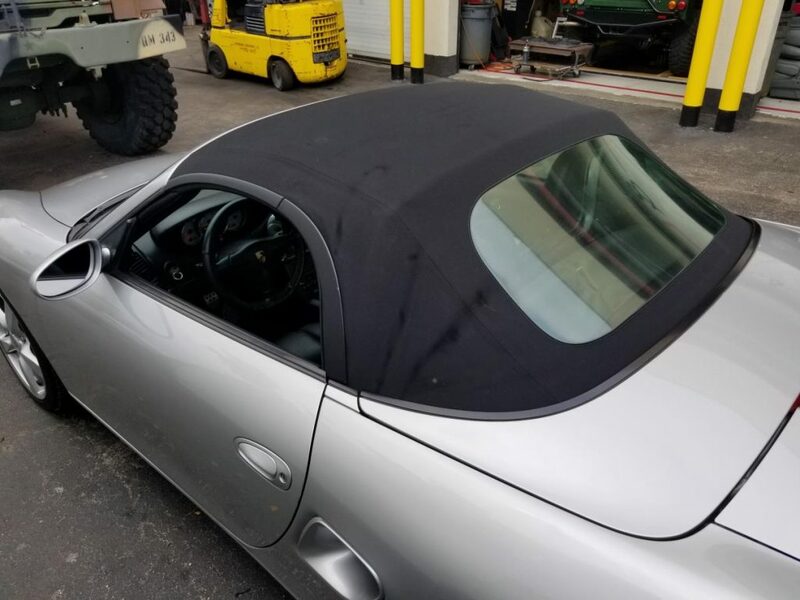 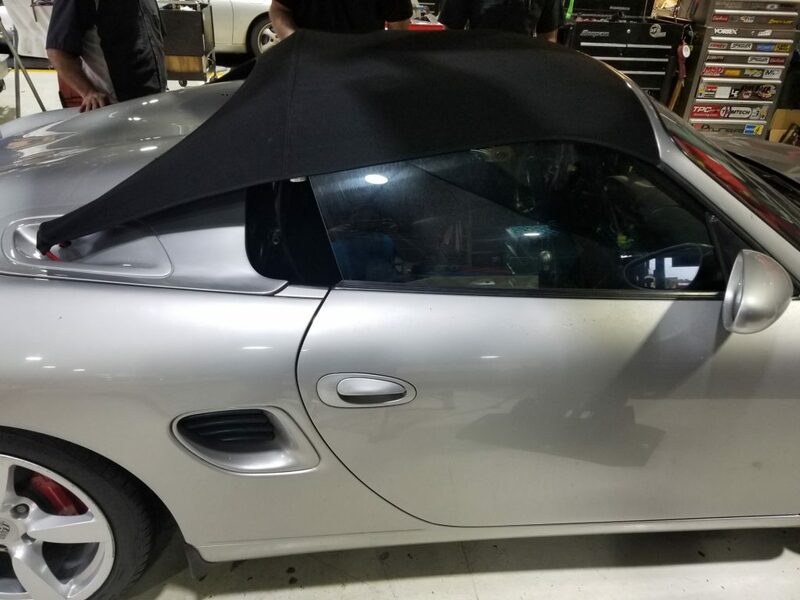 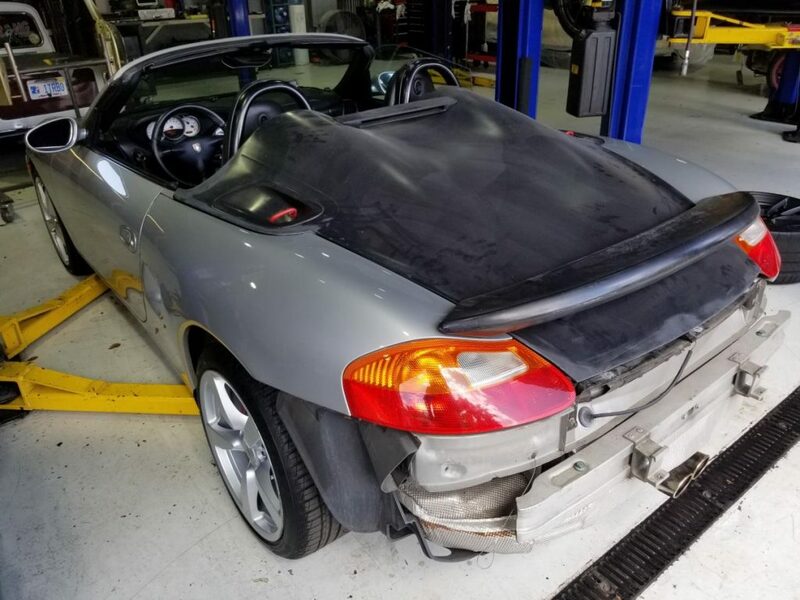 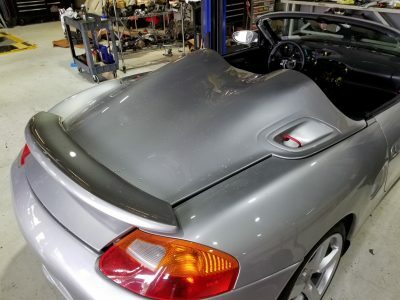 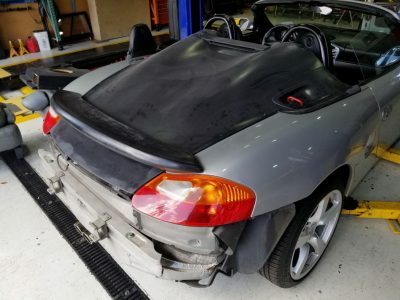 The entire factory rear decklid, clamshell, convertible top canvas, convertible top gears, cables, motor are all removed and replaced with our 986 Spyder lid with integrated third brake light and aero style rear spoiler. 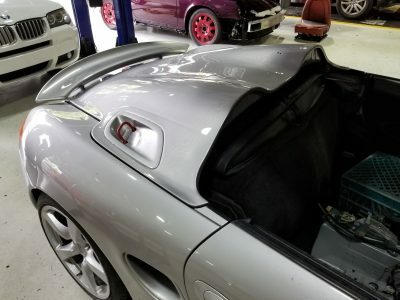 This client wanted to have a few extra items added to the exterior to really enhance the overall look. A set of lightweight aero style rocker panels and a front original tequipment aero bumper were sourced to complete the exterior look. 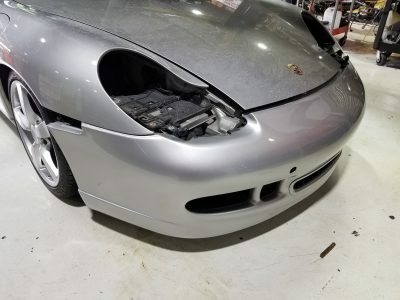 The front bumper received a set of daytime LED running lights and radiator protection screens in black. A black manual canvas top and windscreen were also chosen (we offer either red or black as choice). 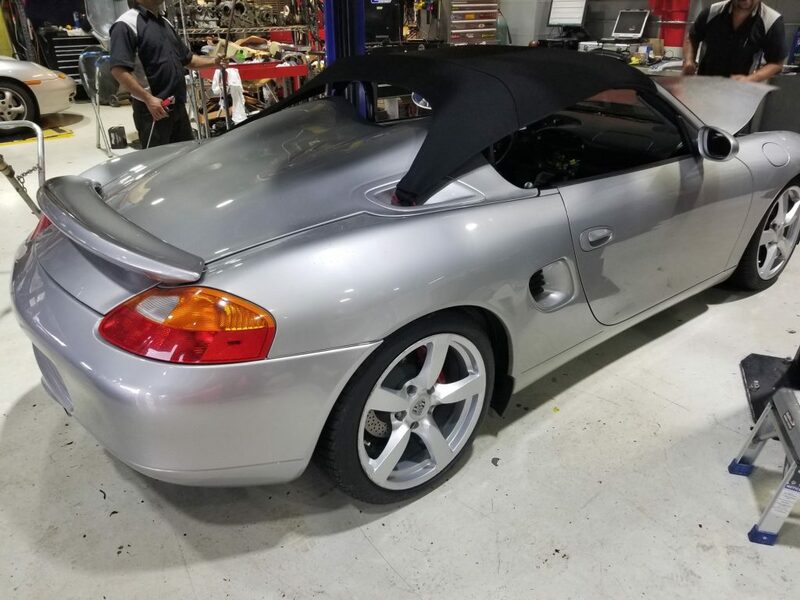 The final touch to the exterior – a set of 19″ lightweight wheels painted in a bright silver paired with new Continental rubber. 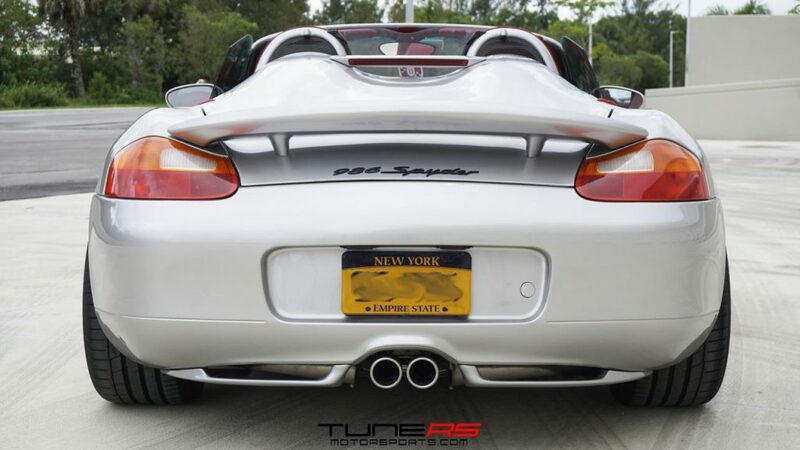 This is the final result of the custom 986 Spyder build for New York. 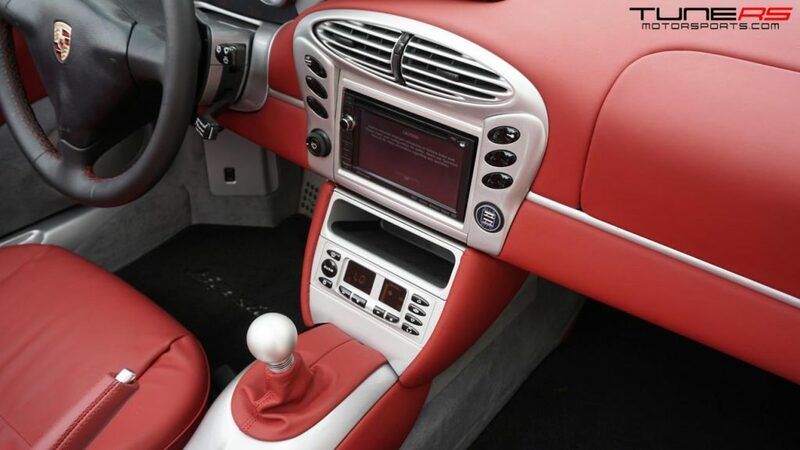 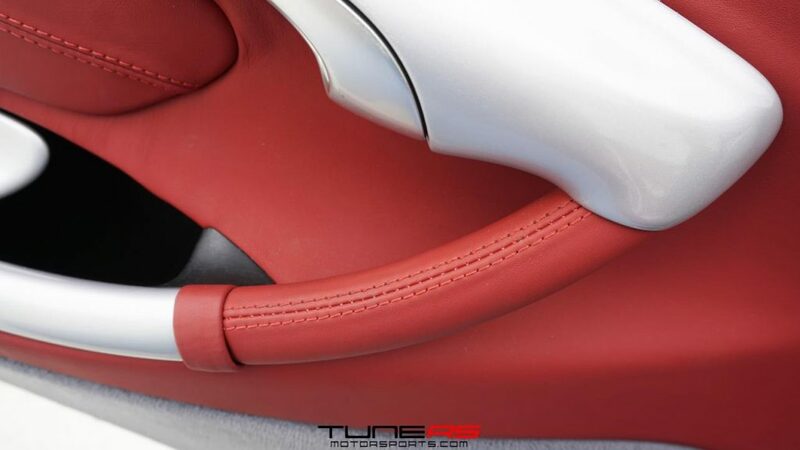 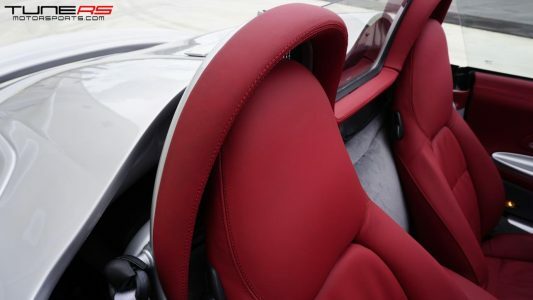 The interior had also been completely redone in all red leather with red stitching and silver components paint to match the exterior. This build was definitely one of the most fun ones to date and really gave this Boxster a new look!